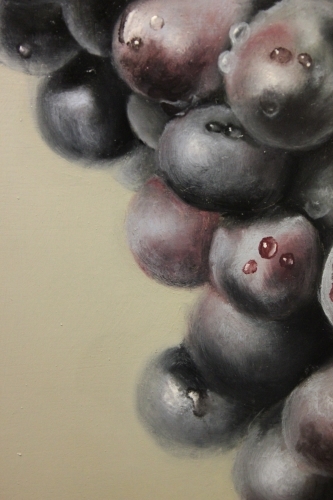 How to paint grapes, Purpose of hard and soft edges in oil painting. How to paint hard and soft edges to dramatize your still life oil painting. 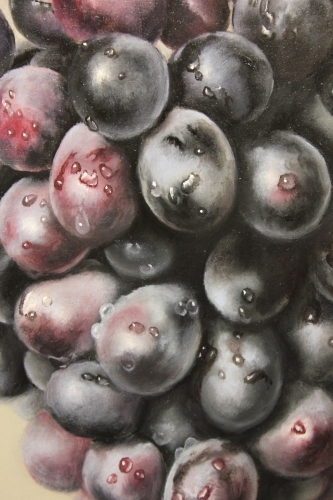 Home > Tips from my Easel > This page on grapes and soft edges. To paint grapes can be intimidating. Yes, they can be difficult and end up looking like the plastic replicas you see at the craft stores. But there are a few rules, that if followed, will help you pull off a convincing bunch of delectable delights. In this demonstration, I started out with my toned canvas, drawing and under-painting. 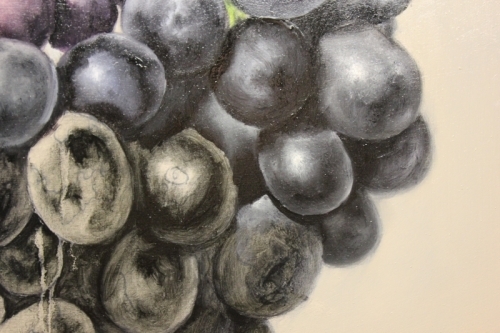 I used black as my primary color in the underpainting as I knew these dark grapes were going to need some extra dark areas to give me my full range of color. In the photo below, you can see the drawing peeping through the under-painting and an already colored background. Even at this point, I was thinking this would be a great example to use soft and hard edges to the max! That bottom right hand grape has an outline that has been blended with the gray background. See below the under painting of grapes. This next pic shows where I've started the color layer. I also include some of the "bloom" (the blue/gray haze that coats most grapes) at same time. 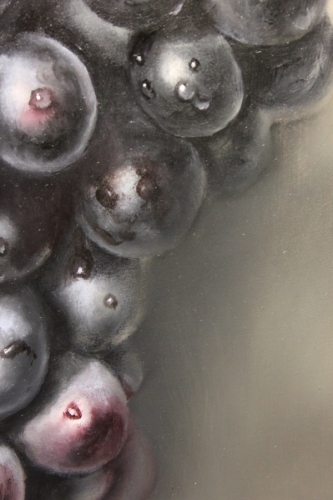 This oil painting of grapes is already beginning to show signs of promise. 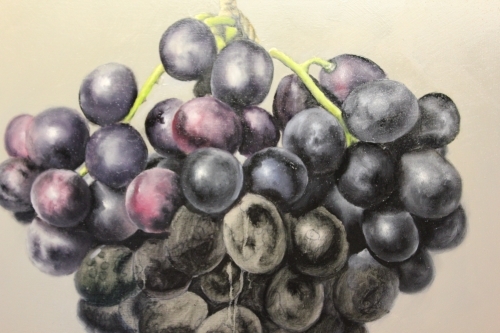 As I move across the painting, most grapes have a deep blue to a deep purple and black color to them. 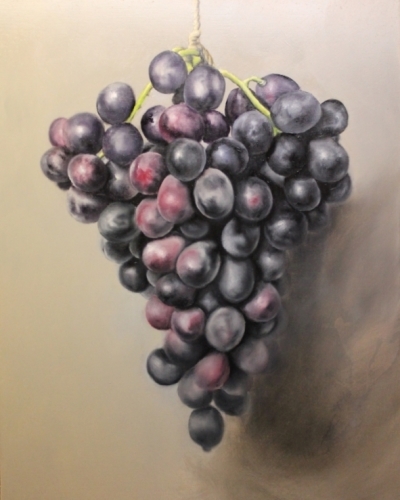 Continued below is more on how to paint purple grapes. The entire top section of grapes color layer done. If you look closely, you'll notice quite a bit of glare in this photo. I'm putting together an article soon on how I completely eliminated that glare, but for now, back to our "how to paint grapes demo". 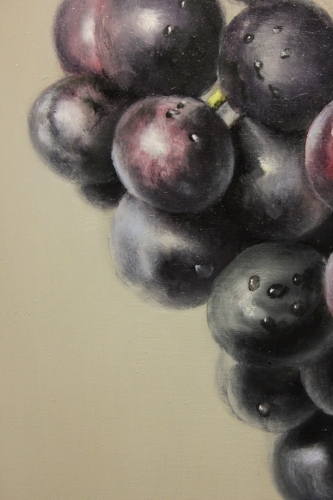 In this painting grapes closeup, you'll see brush strokes that are left and not blended out. 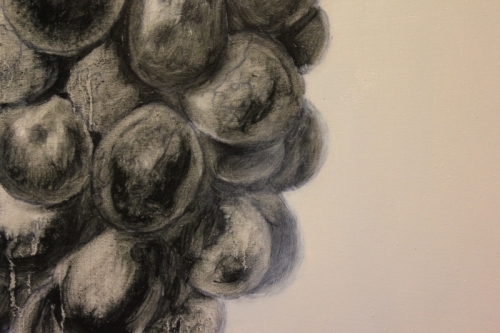 These become part of the individual universes that each grape becomes within the painting. This is one of your rules, each grape must be different, like snow flakes, no two are the same. At this point the entire painting has it's first color layer completed and a shadow has been added to the right side. 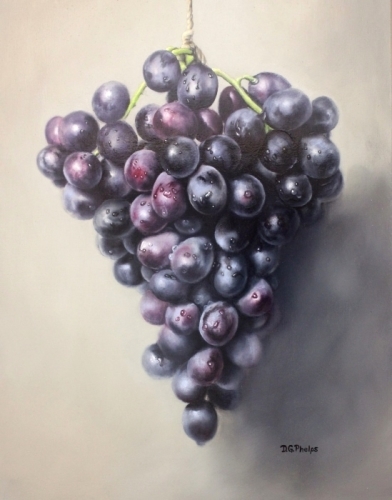 If you are enjoying this painting grapes demonstration, please share it with your painting friends by "liking" the page, or adding it to your google plus, tweet about or "Pin it" social connections! Now we get into the closeup details of the finishing layer being put in. Another simple rule, no two water droplets can be exactly the same. Other wise, it's gonna look like the cheap mass produced art you find in the dollar stores. Take your time, your customers are gonna love you for the time you put into these details. This photo shows the center of interest in my painting of grapes. One thing I hope you've noticed. The front three grapes are retaining their sharpness where as all other grapes are beginning to lose two things, contrast and focus. this is accomplished with just a touch of the blending brush to knock off some of the paint edge, and this softens the highlights. More blending also takes away the crispness of an edge. 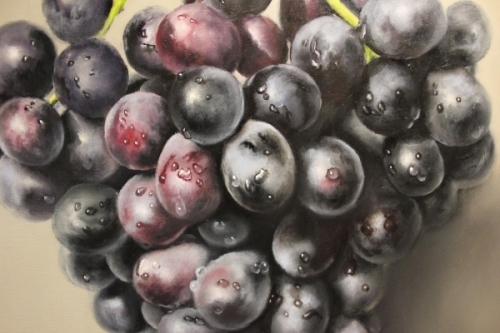 I discuss how to paint grapes in more detail here within my e-book if this demonstration doesn't give enough examples. It does open in a new window so you don't lose your place here. Now, lets work our way around clockwise for to see the soft edges on the perimeter of the group of grapes. As you can see, some grapes are blended right into the shadow. It's actual edge is only suggested. The closeup of grapes painting is just a little larger than actual. We now travel a bit lower down on the right side again, background grapes are blended into the shadow and all lines are blurred. You can't see any hard edges within the shadows. Note also when you paint grapes, or any other fruit, flower, or item that would contain a dew drop, these drops have certain rules too. Notice that the darkest part of a dew drop picks up the darkest color within the surrounding area. The photo below shows this excellent example. Different color in the grapes, different color in the drops. 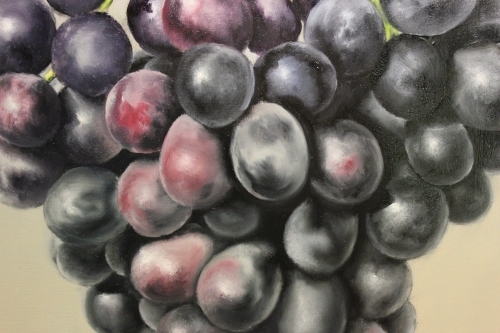 Below is the closeup of purple grapes painting. Now we switch over to the left side. Coming up on the left side, these background grapes are blended into the background or the background color is added to the grapes edge as a reflection. That very bottom grape is a great example. 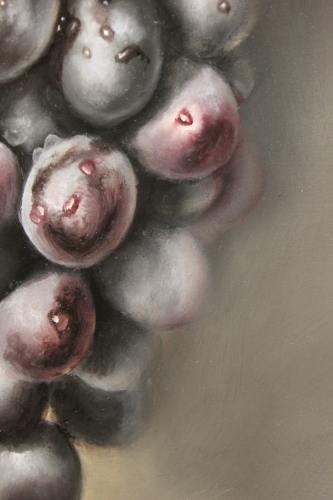 I continue this process of adding background color to the edges of the grapes. This is repeated as we continue to go clockwise around the background grapes. My purple grapes oil painting is finishing up nicely. Below is the final image with signature. It's important to understand the use of soft and hard edges in your paintings. 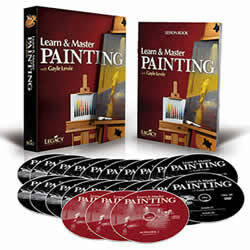 It helps in fooling the eye where the focal point is in your painting, and what should be considered behind the focal point and sometimes, in front of the focal point but not an area of interest. So, when you paint grapes, don't become frustrated, just remember a these few rules, and they'll turn out fine. Ivory Black, Prussian Blue, Ultramarine Blue, Alizarin Crimson, Titanium White, Burnt Umber, Yellow Ochre, Cadmium Yellow Light. The grapes were primarily the blues, black and Alizarin. The bloom was titanium white and ivory black and a touch of prussian blue. The background was a gray mixture with a touch of yellow ochre. The stem was a Cad Yellow light with ultramarine blue. The rope was a burnt umber, white and a touch of ivory black. 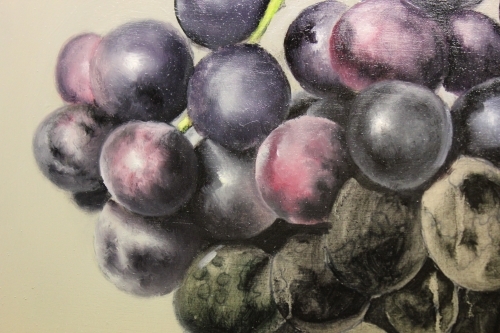 Click here to go back to the top of our how to paint grapes demonstration. Here's a quick video click of the information above, and some really cool music!